Pizzeria Europa is located in Auronzo di Cadore, along the main road leading to Misurina and Cortina, and it is only 700 meters far away from the Monte Agudo ski area. It is a totally new local, from the dining room to the kitchen; but above all, are the sympathy, courtesy and friendliness the requirements that we offer to make every customer feel like at home. 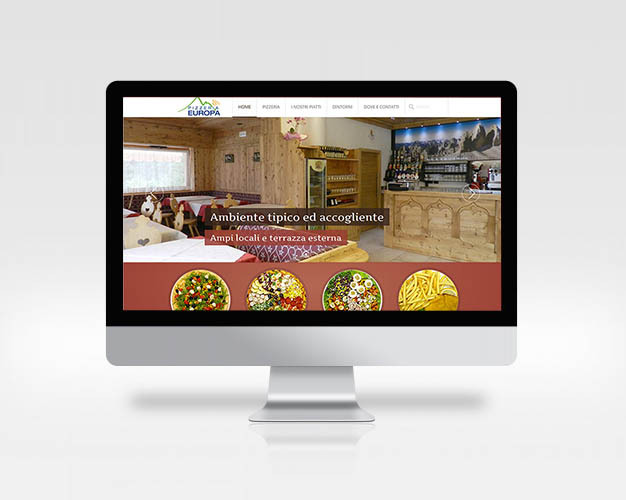 Our pizzeria is furnished in Tyrolean style, all in hand-worked and hand-painted wood. In love with fresh air? Outside the restaurant there is a large terrace! In summer you can taste our dishes in the beautiful outdoor terrace in direct contact with nature or, for those who want it, inside. In winter, Pizzeria Europa offers its guests a warm environment where you can enjoy our specialties surrounded by the beauty and warmth of wood. After a day spent on the snow of Monte Agudo, only 700 mt far, we offer you a wide variety of delicious Pizzas and other specialities. We also offer you a rich choice of homemade desserts all accompanied by a glass of beer.